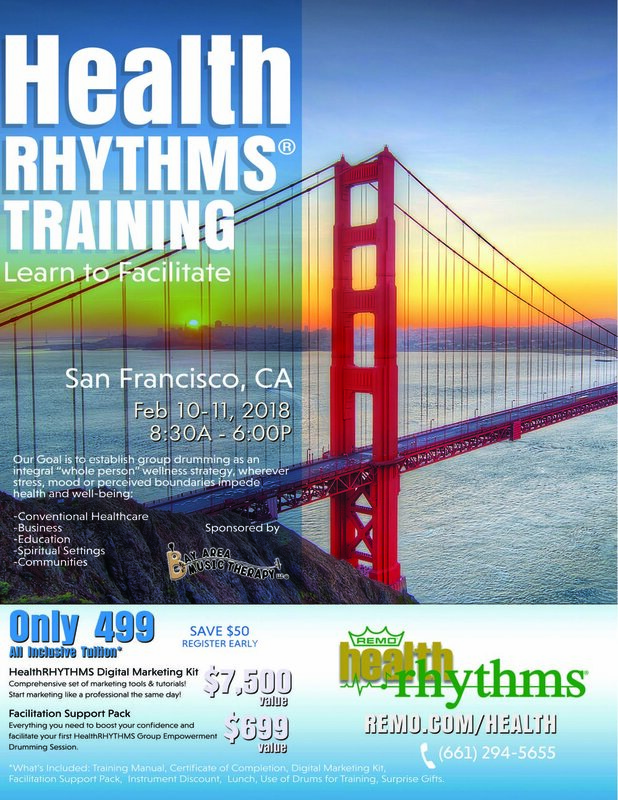 Bay Area Music Therapy LLC is proud to be hosting the San Francisco Bay Area’s first REMO HealthRHYTHMS Facilitator Basic Training! HealthRHYTHMS is a fun, evidence-based whole person strategy which promotes socialization and ensures a healthy non-strenuous workout. On a deeper level is builds bridges while fostering nurturing, support, camaraderie, self-respect and respect for others. It is not really about drumming, but uses the drum as a tool for communication and personal expression. It can be integrated as a therapeutic strategy in group counseling sessions, support groups, rehabilitation centers, schools, hospitals, aging facilities and more. The HealthRHYTHMS Protocol is the foundation of our HealthRHYTHMS Group Empowerment Drumming Program and consists of a series of 10 steps participants are guided through to facilitate communication and personal expression. Research has shown the benefits can include: strengthened immune system, reduced stress and burnout rates, improved mood states, enhanced creativity and bonding, and more. Our Goal is to establish group drumming as an integral “whole person” wellness strategy in conventional healthcare, business, educational and wellness environments. Wherever stress, mood or perceived boundaries impede health, work/role performance and wellbeing, HealthRHYTHMS can be a useful tool. Who Should Attend? Our program is open to doctors, nurses, allied health professionals, social workers, counselors, psychiatrists, teachers, musicians, therapists (music, recreational & occupational), HR professionals and other caring individuals who wish to integrate group drumming activities in their workplace or community. Trainer: Christine Stevens, Msw, MT-BC, MA holds masters degrees in social work and music therapy. She is the founder of Up Beat Drum Circles and the author of “Music Medicine, The Healing Drum Kit”and “The Art and Heart of Drum Circles.” She appeared on NBC, PBS, KTLA, and the Discover the Gift DVD. As a co-developer of the REMO HealthRHYTHMS Training program she has trained facilitators from 25 countries. Christine has worked with Fortune 500 companies, survivors of Katrina, students at Ground Zero and led the first drum circle training in a war-zone in northern Iraq. HealthRHYTHMS Training is approved by the Certification Board for Music Therapists (CBMT) for 15 continuing music therapy education credits (CMTE). Remo, Inc. #P-073 maintains responsibility for program quality adherence to CBMT policies and criteria. Note: If you are seeking CE credit for a profession other than music therapy, it is your responsibility to contact your certification/licensing board directly to assess eligibility of this training to meet your continuing education requirement. No prior musical experience is necessary. You do not have to be a healthcare professional, musician or a drummer to facilitate this program. Bay Area Music Therapy LLC (BAMT) is proud to announce the opening of their new home in Oakland, CA. The Center for Healing and Expression is located at 5549 Claremont Avenue, within minutes from the Rockridge BART station. Nurturing a rich and diverse community of integrative and allied professionals, this new center is scoring a community that serve many of the same populations BAMT serves. The center has a large group room, two smaller studios for 1:1 services, and a beautiful garden area in the back. It is located right off of Highway 24 and there is ample street parking in the neighborhood. Ian Wilkerson, founder and CEO of BAMT, decided to open up the center in honor of his late mother, Michele Newmark, a Reichian Therapist, nutritionist, and healer, who passed away in April of 2016. Michele owned and operated a former Center for Healing and Expression in San Francisco, CA, for many years. Ian and his mother had dreamed about opening a new location in the East Bay that combined their work with other allied providers. Helping to realize this vision, their cousin Dr. Pam Stalzer, D.C., has joined in and moved her Bay Area practice in to the new center. The Center for Healing and Expression’s logo was designed by Ian’s sister-in-law, Yu Tsao. The hummingbird symbolizes the legacy Michele Newmark has left behind and this new East Bay center will build more community in her spirit and loving embrace. The hummingbird reminds us to forever seek out the good in life and the beauty in each day. It is a reminder of how we expend our own energy, to be more present and playful, resilient and adaptable, to hold on to a lightness of being and enjoyment of life. Please join us for our open house, from 2:00 PM – 5:00 PM on Saturday, March 25th, 2017, to celebrate the opening of the Center for Healing and Expression. Dr. Stalzer will be providing free consultations, and Ian will be performing a few original songs as well. Light refreshments will be provided, and there will be opportunities for group music making.